This page is part of the site located at http://logan.illinoisgenweb.org/. There is NO charge to access any page on this site. If you have arrived here from a pay site, you can click here to go to the original free ILGenWeb site. This picture was contributed by Darlene Lercher Smith. She does not know the names of the people in the picture. Do you? She believes that they include Anna May Irving Lercher and her sister Lela Jane Irving Downing. These are notes by Anna May Irving Lercher, Darlene's grandmother, that were with the picture. You are invited to attend the 3rd annual reunion of the Cornland School to be held at the M.E. Church in Cornland on June 9, 1935. Picnic dinner at noon. Come and meet friends you have not seen for years. Greetings to all my friends present at the 1937 Cornland School Reunion: Owing to a bit of bad luck I am not with you in person today, but am thinking of the nice time I know you will have. I am glad to say that I am on the upgrade again, and am looking forward to celebrating the 1938 Reunion with you. Good luck, and a happy day to all. Welcome old friends. Yes, the Leach family I see occasionally - I hope Ethel will be with you. Due to various reasons (which I do not care to mention) I wish to resign as Scty-Treasure of the School Reunion. Minutes of last yr. Meetings & nominating Comm. Reading of letters. Frank Zimmerli, Erma McCue & Netti Nicholson Benediction. Neina 729 W Grand Decatur Ills. Mrs. Myrtle Rentchler - Illiopolis Ill.
Song by Lynman Key - "Silver Haired Daddy of Mine"
Frank Zimmerli, Georgia Lanterman, Alsie Townes, Guyola Criland Sec. Of Treas. Main page. To return to the page from whence you came use your browser's BACK button. 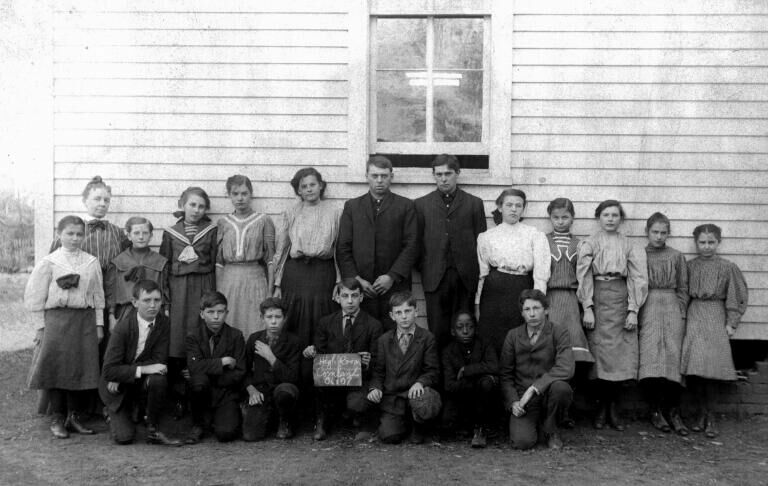 This page is "Cornland School" on the Logan County, Illinois, ILGenWeb site. The address of this page is http://logan.illinoisgenweb.org/cornlandschool.htm. This page was last revised on December 2, 2003. All materials contained on these pages are furnished for the free use of those engaged in researching their family origins. Any commercial use or any use for which money is asked or paid for any reason is strictly prohibited.